Hello everyone! 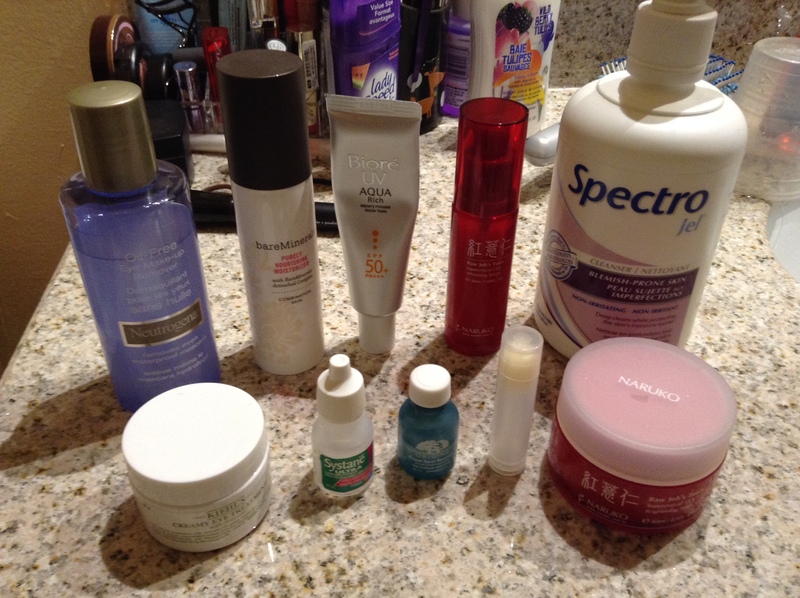 I have a skincare post that I have been meaning to do for the past little while. As you know I went on Accutane and since that experience is over and done with I’ve been meaning to show you what sort of products that I use to help me get rid of the scars leftover. Well here are the products that I use on a daily basis and would recommend to anyone who is looking for some great basic skincare products. Since I change out a lot of my products I plan on doing another one in a few months time. Makeup Removers – MAC Cleanse off Oil (not shown) – This was a new addition when I started using makeup daily but I have always been a firm believer in removing makeup before actually cleansing the skin. I like this product but I’m not really loyal to any cleansing oils so it changes every time I finish a bottle. Neutrogena Dual Phased Eye Makeup Remover – I love dual-layer eye makeup removers and Neutrogena makes one of my favorites but since discovering the Maybelline Clean Express version I don’t really want to purchase the Neutrogena anymore because of price points. But putting price points aside this sort of products is what I will continue to repurchase. Cleanser: Spectro Gel for Blemish-prone skin – Definitely one of my favorites to use the gel formulation is wonderful and gentle on my skin. I’ve been using this cleanser for about 5 years now and it’s always a staple in my skincare routine. Serum: Naruko Raw Job’s Tear Whitening Serum – I have been using Naruko serums on and off for the last 3 years and they make my favorite serums. The texture of these are wonderful and absorb well into the skin I always have one on hand because they are just that awesome! Moisturizer: Bare Minerals Purely Nourishing Moisturizer for Combination Skin – When I was on Accutane I actually used the Dry skin version of this moisturizer and really like it but I’m not really a big fan of this one. The earthy soil like fragrance really gets to me everytime I use it so when this is done I won’t be repurchasing. Naruko Raw Job’s Tear Night Gelly – This is technically a night cream for me but in gel format which is really cool and it’s really cooling at night as well. I do notice my skin looks a little brighter when I use this but the effect doesn’t last so in the morning I look not so bright. Eye Cream: Kiehl’s Creamy Eye treatment with Avocado – This has replaced my usual favorite Clinique All About Eyes Rich and it is a bit cheaper considering the amounts that I get in a little jar. I really like the way this feels on my eye area and despite it’s $56CDN price tag I am willing to repurchase it when I run out. Sunscreen: Biore SPF 50+ Sunscreen – I have to say that I exclusively purchase Asian sunscreens because they last longer, don’t have that weird sunscreen scent, better packaging, and better textures. But out of all the Asian sunscreens that I have tried Biore is one of my favorites and I have purchased many of their products. SPF is important even in the winter! Extra: Origins Super Spot Remover – One of my favorite spot treatments it’s so satisfying to see that a large zit has been reduced to almost nothing the next day! Rocky Mountain Soap Company Cherry Lip Butter – This has always been a staple in my skincare I use it at night to ensure that my lips aren’t chapped in the morning. I keep going back to this because this product is just that awesome! Systane Eye Drops – I usually use the lubricant kind but couldn’t find it so this version is what I have been using. When I was on Accutane my eye doctor was like “OMG your eyes are as dry as the Sahara desert!” and then proceeded to recommend me these brand’s drops and it is really good. I really like them and even though I’m not on Accutane anymore it really like the way it feels and this has stuck in my routine since. Well that was everything I hope that you enjoyed this post and since it’s the end of the month there are some more update posts on the way.